The evolution of equipment is part of the fascinating story of golf. We take a look at the history of golf balls and golf clubs. The game of golf rounded into shape in the mid-1300s when golf balls began to be fashioned out of wood. They were challenging to make because they were created out of the wood of the beech tree. Beech is a hardwood that is more dense and sturdy but was ideal for carpenters to handcraft for playing golf. The problem lay in the fact that the carpenters couldn’t make them perfectly round. Hand-assembled, Featheries were balls that needed water, feathers, cowhide and lots of time. After the leather pocket was stuffed with feathers, the craftsman would wet the outside of the ball so that when it dried, it shrank and hardened the golf ball. Making featheries were so labor-intensive that only the rich could afford to use these balls. Golf balls took another step forward in the mid-1800s when Adam Paterson of St. Andrews created the “Guttie.” With the expansion of the railways in the United Kingdom, golf found a surge of popularity. With crowds of hungry golfers looking for a better ball, Paterson made the Guttie from the rubber sap of the Gutta tree. When the sap was heated, it could be melded into a spherical object and used for golf. Unlike the expensive Featherie, the Guttie could be mass produced with a fraction of the effort and expense. With the rubber core, the Guttie was easy to fix as it could be easily remolded by applying heat. As time passed, the Guttie began to attract its fair share of detractors. With a smooth outer surface, the ball didn’t fly as far as Featheries did. So, in a search of building a better Guttie, patterns found their way onto the surface of the rubber balls. These patterns began with little circular bumps that were raised on the surface. Golfers found that the balls that had patterns were easier to control and flew further than the original Gutties. With the arrival of the industrial revolution, Gutties became an even simpler way to produce an inexpensive golf ball. At the turn of the 20th Century, Coburn Haskell invented a one-piece rubber-core golf ball that was immensely popular among professional golfers. The ball flew further than Gutties and was constructed by taking the rubber core and wrapping it in rubber thread. With the invention of a thread winding machine, Haskell golf balls were mass-produced and easily affordable for most golfers. The patterns used on the golf balls took another step when William Taylor applied a dimples to a Haskell ball. Golfers found that the Taylor modification made the ball fly further and higher than anything previously created. The Haskell ball stayed relevant throughout the 1900s until Spalding debuted the Executive, a two-piece ball in 1972. With the arrival of the Executive, the dimpled golf ball began using balata and urethane covers. Urethane and Surlyn are the compounds that many golf ball manufacturers continue to use to this day with their upper-tier products. Much like the golf ball of the day, the clubs used by the earliest adopters of golf owe a great deal of gratitude to wood. For multi-piece clubs, beech and holly trees were used to create the club heads while ash and hazel were used for the shafts. Due to their primitive design, it wasn’t uncommon for a golfer to break around one club per round. For those who crafted their clubs out of one piece of wood, the complication construction of the multi-pieced golf clubs was overpriced and not worth the hassle. A set of those early clubs consisted of “longnoses” which shared parallels with the common day driver. Next, “grassed drivers” were used for medium range shots, and “spoons” were for around the green work. A “cleek” was used for putting. Looking for a way to increase distance, metal club heads began to find themselves on the end of golf clubs around the mid-1700s. These hand-crafted heads were obscure and only available to the wealthy. It wasn’t until the early quarter of the 1800s that Robert Forgan changed golf club manufacturing by importing hickory wood from the United States to his native Scotland. Around the time of the Guttie’s creation, Forgan’s clubs became popular due to their stability and sturdiness. With its’ innovation in club design, Scotland became known around the world as the country that created the best golf clubs that money could buy. In the early 1900s, aluminum began to be used in the handcrafted forging of metal club heads for irons. Steel shafts were also introduced around this time but weren’t adopted until the R&A allowed their use in 1929. By this time, the ability to mass produce golf clubs using a multitude of materials had become commonplace. 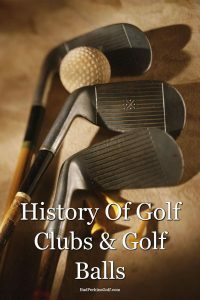 The golfing industry looked to rein in these varied styles after the conclusion of World War II by focusing solely on the affordability of synthetic and composite materials. It wasn’t until the early 1960s that these materials began making high-quality golf clubs that were plentiful for the middle socio-economic classes. The graphite shafts, which are common among today’s professional golfers, debuted in 1973. The first graphite-based shafts were flimsy and had far too much flex. By adding boron, manufacturers found that the shafts lost their twist and became firmer. With new supplementary materials added over these past few decades, current graphite shafts became stiffer and more reliable. Taylor-Made was the first company to bring metal-headed woods to market. But Callaway was the company to bring them to the forefront with their 1991 introduction of the successful “Big Bertha” series of drivers and fairway woods. Considering the evolution of golf equipment over the centuries, one thing that has not changed is that golfers around the world will continue to be hungry for the next innovation. As this history of golf balls and golf clubs shows, for lovers of the game, there will always be a search for equipment that can save strokes.